Bill Of The Month: Urine Test Became A Financial Nightmare : Shots - Health News A few months after surgery for a painful spinal disk, a woman's doctor asked her for a sample of urine during a follow-up visit. The routine request turned into a financial nightmare. Liz Moreno thought she was done paying for her back surgery in 2015. But a $17,850 bill for a urine test showed up nine months later. 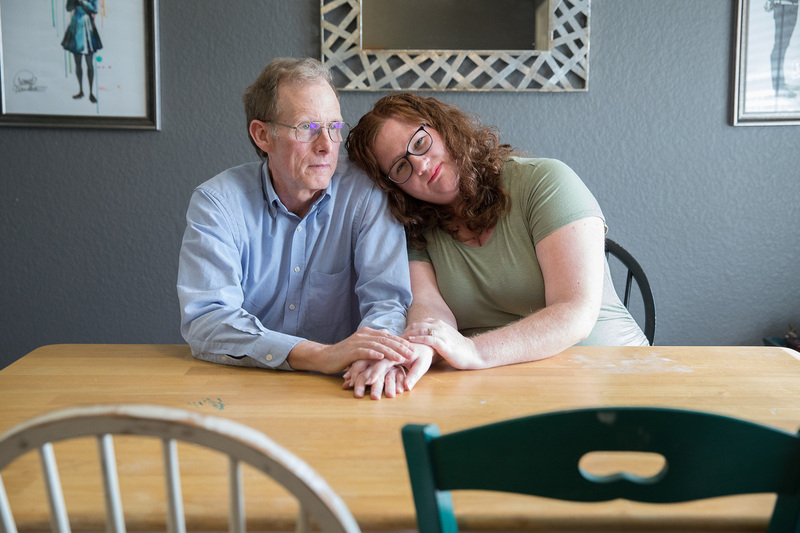 Her father, Paul Davis, a retired doctor from Ohio, settled with the lab company for $5,000 in order to protect his daughter's credit history. In her late 20s and attending college in Texas, Elizabeth Moreno suffered from debilitating back pain caused by a spinal abnormality. "I just could not live with the pain," she says. "I couldn't get dressed by myself, I couldn't walk across my house, let alone to class, and nothing, no drug that had been prescribed to me, even dulled the pain." Moreno says she also tried chiropractic medicine and acupuncture, but they didn't make the pain go away. Finally, a doctor at the student health center referred her to an orthopedic specialist who performed tests and concluded a disk was blocking nerves down her legs and needed to be removed. Moreno's father, a retired Ohio doctor who had seen many failed back surgeries over his career, agreed it was the best course. In late 2015, Moreno had the operation in Houston, which she described as "a complete success." She gave it little thought when the surgical office asked her to leave a urine sample for a drug test. Patient: Elizabeth Moreno, then 28, a student at Texas State University in San Marcos. Medical treatment: Moreno had a disk removed from her back in December 2015. Her surgeon prescribed an opioid painkiller, hydrocodone. At a follow-up office visit in mid-January 2016, the staff asked her to leave a urine sample, which she figured was routine. In March 2017, the lab sent her a bill for $17,850 for testing her urine for a slew of drugs, including cocaine, methadone, anti-anxiety drugs and several other drugs she had never heard of. What gives: Urine drug testing has exploded over the past decade amid alarm over rising opioid overdose deaths. Many doctors who prescribe the pills rely on the urine tests to help reduce drug abuse and keep patients with chronic pain safe. Yet the tests have become a cash cow for a burgeoning testing industry, and critics charge that unneeded and often expensive ones are sometimes ordered for profit rather than patient care. Doctors can decide whether to test patients who take opioids for short periods, such as after an operation. Moreno's surgeon would not discuss her urine test — why he ordered it and why the sample was tested for so many substances. Three experts contacted by Kaiser Health News questioned the need for such extensive testing and were shocked to hear of the lab's prices. They said these tests rarely cost more than $200, and typically much less, depending on the complexity and the technology used. Some doctors' offices use a simple cup test, which can detect several classes of drugs on the spot and could be purchased for about $10. Bills can climb higher when labs run tests to detect the quantity of specific drugs and bill for each one, as the lab did here. The experts said the lab's prices for individual tests were excessive, such as charging $1,700 to check for amphetamines or $425 to identify phencyclidine, an illegal hallucinogenic drug also known as PCP. They also criticized a charge of $850 for two tests to verify that her urine sample had not been adulterated or tampered with. Moreno's insurer, Blue Cross and Blue Shield of Texas, refused to pay any of the bill, arguing that the lab was out of network and thus not covered. Had it chipped in, it would have covered the service at $100.92, according to an explanation of benefits the insurance company sent to Moreno. Sunset Labs says its list prices were "in line" with its competitors in the area. It also said doctors treating pain agree extensive urine testing is "the best course of action" and that a lab "is not in the position" to question tests ordered by a doctor. Resolution: Fearing damage to his daughter's credit rating, Moreno's father, Dr. Paul Davis, paid the lab $5,000 to settle the bill in April 2017. A retired doctor, he also has filed a formal complaint about the bill with the Texas attorney general's office, accusing the lab of "price gouging of staggering proportions." The lab's attorney said he was not aware of the complaint. A Texas attorney general's spokesperson confirmed to KHN that the office had received complaints about the lab but declined further comment. The takeaway: When a physician asks for a urine or blood sample, always ask what it's for. Insist that it be sent to a lab in your insurance network. This is the debut of a monthly feature from Kaiser Health News and NPR that will dissect and explain real medical bills to shed light on prices in U.S. health care and to help patients learn how to be more active in managing costs. Do you have a medical bill that you'd like us to see and scrutinize? Submit it here and tell us the story behind it.